While an accident is rarely a laughing matter, we’ve found the recovery phase can be an entirely different story. Just recently, the younger of our two dogs, Jasmine, was so preoccupied chasing the cat back into the house after a sunny sojourn in the yard, that she brushed too close to a drawer handle which snagged her collar and yanked her sharply backwards. She panicked, thrashed around wildly trying to free herself and yelped madly when the 2cm of protruding handle punctured her side and then she wriggled around even more while impaled on it. At first sight, the wound appeared to be a clean hole about the size of the top of your little finger and there was no blood to speak of coming forth, but we couldn’t be sure of the extent of the damage she’d done to herself. Jasmine’s a fairly lean but very strong dog. Had she cracked a rib or punctured her lung? You could see right down under the skin to the membrane below. And she was pretty much in shock, shivering and looking at a loss to what had happened. 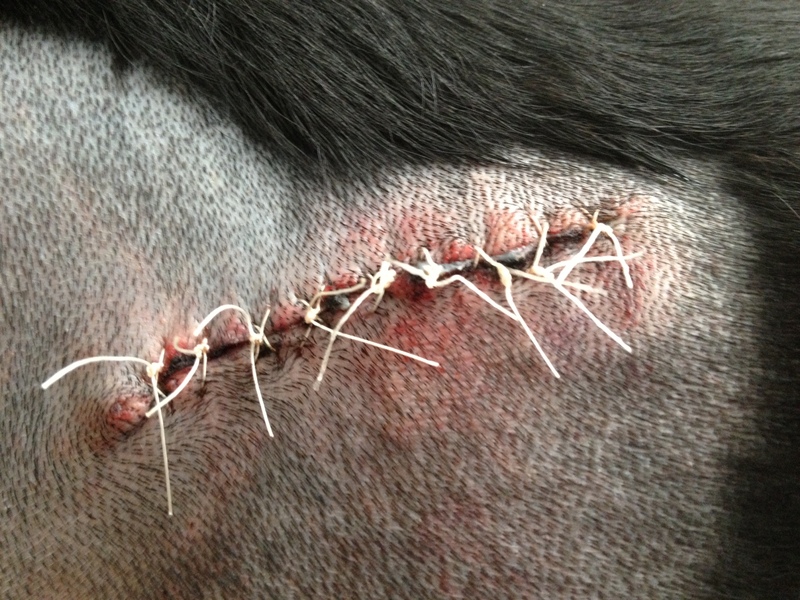 A new vet at the practice, the kind Daniel, initially thought he might be able to staple the wound shut. However, when he shaved Jasmine down, it became evident by the bruising she’d sustained that the damage was more extensive, so he suggested the staples solution was unlikely to hold the compromised skin together. He also planned to take a better look around the area while she was under anaesthesia and use stitches to close up a bigger wound. While she was under, he found that she’d pushed a plug of hair and skin well up under the skin around the initial wound. That necessitated a search-and-remove manoeuvre to clean out as much foreign matter as possible, to discourage infection. This culminated in an incision many times the size of the original puncture itself and it had to be closed with 10 stitches. A few hours later we collected a still-groggy Jasmine and took her home to rest and recuperate. But even slightly tipsy dogs get hungry as they come around, so Jasmine still devoured her dinner with her usual relish. And she backed up afterwards for the slice of cheese with her antibiotic embedded in it … the first time. The next morning, of course, she had woken up to the ruse. So we spent a good deal longer getting her to swallow her morning dose. As the five days of morning and evening pills went on, the battle became one of wills, with Jasmine finding many ways of regurgitating whole or part pills and us trying to re-insert them. This, of course, presented us with a challenge, as our other dog is a labrador and she will eat anything that looks even remotely like food which happens to hit the deck. 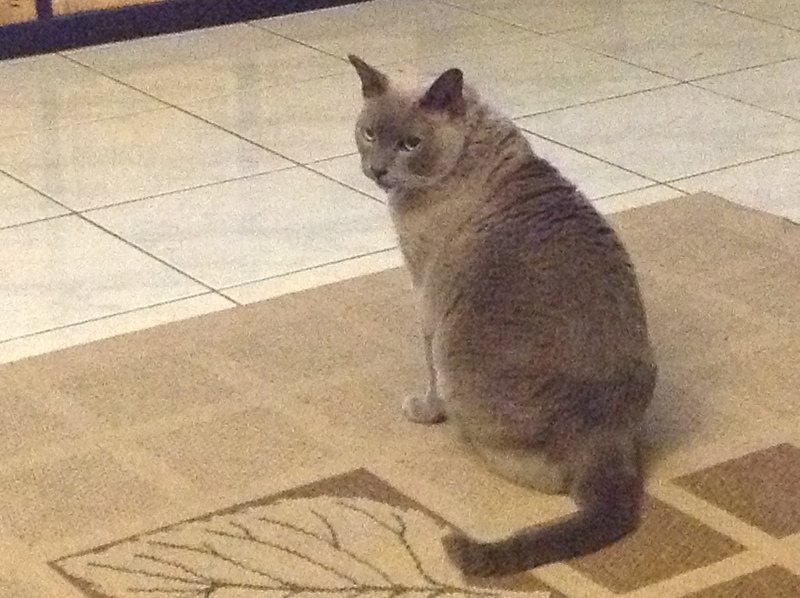 As well, our elderly diabetic cat, Puska, isn’t much better. Perhaps it’s his eyesight. So we’d have to stalk Jasmine as she tried her best to rid herself of her twice-daily dose of antibiotics, restrain her and return said pills to their rightful place at the back of her tongue, stroking her neck gently to encourage her to swallow them. On Day 2, after the initial effects of the anaesthesia wore off, Jasmine was inclined to start licking her wound, so it was back to see the kind Daniel who fitted “the collar of shame”, a plastic Elizabethan collar, to help keep the incision site clean. Getting her back into the car was hysterical and when we arrived home and she saw Layla did not have one, Jasmine’s stubborn streak came out. She just stood, staring straight ahead, rather than settling on her bed or the mat in the lounge room. We were determined to follow Daniel’s directions to keep it on until her stitches were to be removed 10 days later, but she was determined to be a statue until we removed it. She was spot-on. Jasmine relented, eventually, and even worked out how to drink and eat without too much trouble. And she even worked out that if something dropped from her mouth, she’d have to lower her head to tip it out on the floor to devour it. Doorways, on the other hand, were somewhat trickier, but Jasmine quickly discovered the plastic cone would bend if she crashed into something. So she milked her predicament for all it was worth, too, clambering up into any adult’s lap for naps if they happened to be watching TV but sleeping soundly was no problem, so she really did adapt to its presence pretty quickly. Her ‘cone of shame’ proved no impediment to Jasmine’s ability to sleep. And she learned that she could give the adults in the household a bit of a hurry on by barging into the backs of our legs. She also demonstrated some pretty snazzy moves when playing with Layla, but her big sister is far more adroit on her feet and quickly worked out that she could dive under the collar to exact her playful revenge without too many repercussions. Puska, however, ended up getting the worst of it. He only ventures outside under close supervision – adults plus both dogs – to nibble on grass. It’s common for the girls to “round him up” if he goes too far or looks like even trying to jump the fence. But Ms Jasmine – who has been known in the past to unceremoniously nose Puska’s rear end in order to hurry him along – soon figured out that this move had new impetus with the aid of her otherwise cumbersome collar. 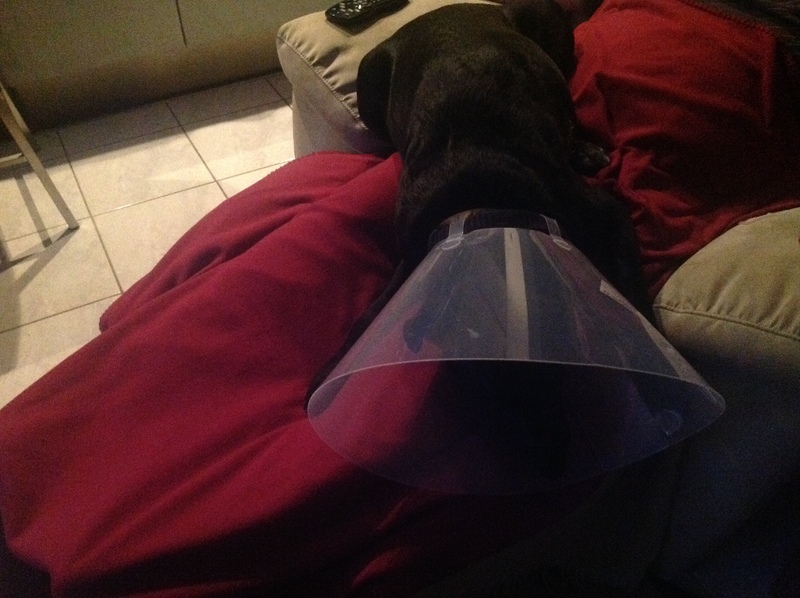 After a few days, Jasmine had settled into navigating with her ‘cone of shame’ quite nicely and there were few other incidents … until my husband returned from shopping one afternoon. As he was unpacking the parcels from the car and walking towards the house, there in the front window was the craziest sight. Puska, who had obviously been asleep in the afternoon sunshine on a cushion near the window sill, had been scooped up as an excited Jasmine raced to the window to welcome Dad home. So here was this 30kg dog barking her usual enthusiastic welcome to her owner while poor Puska was trapped inside the cone which was, by then, hard up against the window. Thankfully, Puska, while a bit shocked and very put out, was unhurt. How he was not deafened by the experience we’ll never know. A few days later it was time to get the stitches out, which went without incident, but after returning home Jasmine was unable to resist licking her wound, which hadn’t quite closed over. 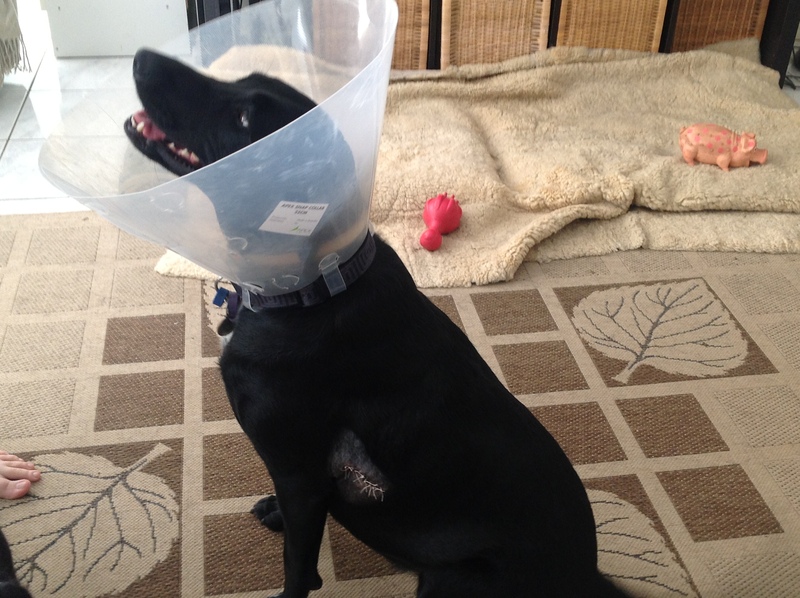 So the cone of shame went back on for three more days, until the wound’s scab had fallen off by itself. It’s now been five days since its removal and thankfully she’s not paying much attention to her scar at all, which is a relief. And her fur is already growing back. 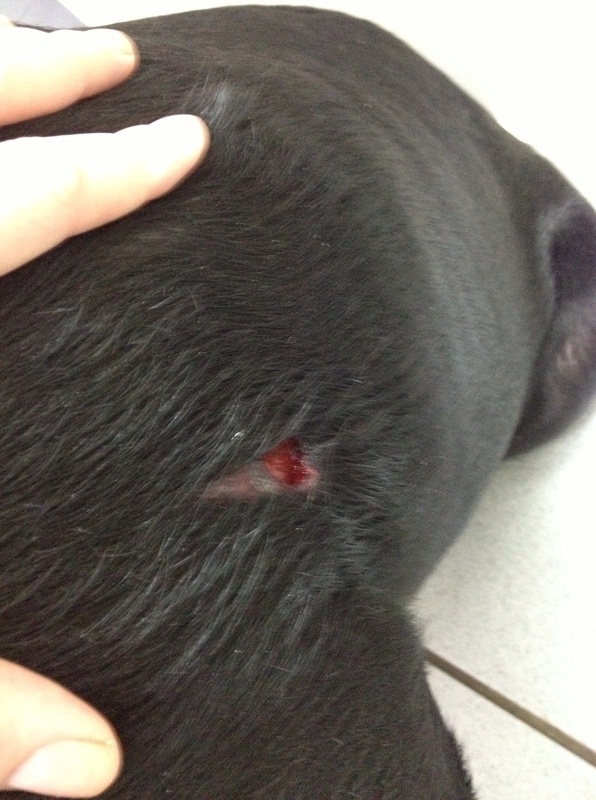 However, in retrospect, we probably should have taken out pet insurance, as the bill for this little incident topped $620. Which is hardly a laughing matter.